Each week we feature an app that has caught the attention of the Crozdesk community. We look for exciting features that make our lives easier, apps that take a radical approach to existing problems or a service that has everyone talking about it. In other words, apps that we think you should know about. 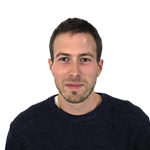 This week, we’ve reviewed WhosOn – innovative software designed to help businesses live-chat and engage with website visitors. 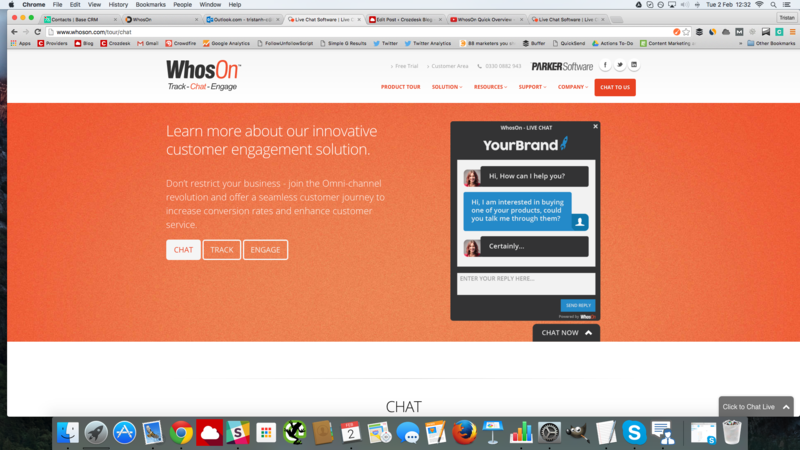 Designed to help businesses connect with customers in real-time, WhosOn is a live chat solution offering customer agents sophisticated chat, customer insight, visitor analytics and reporting tools. 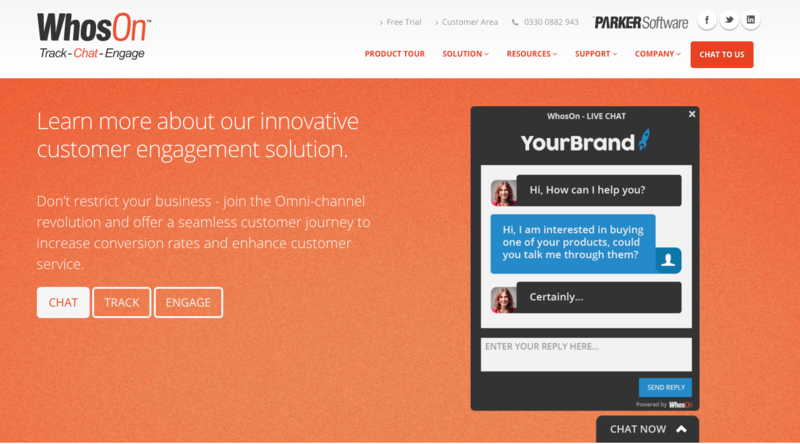 WhosOn’s creators, Parker Software, have been specialising in live chat communication solutions since 2003, designing products for a growing market in real time customer engagement solutions. Other products in the company’s portfolio include a lead capture and sales enablement tool, Think Automation and a site visitor intelligence solution, Prospect Agent. 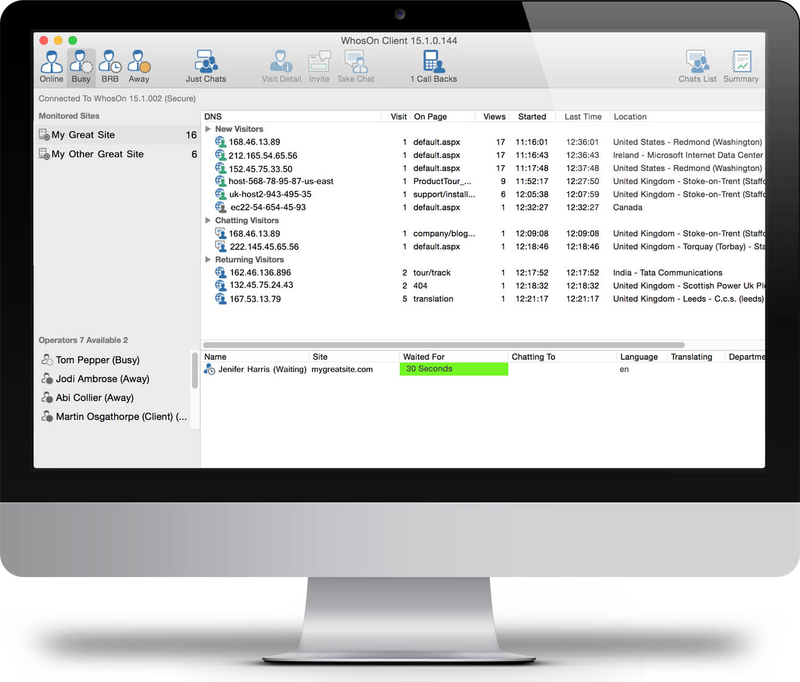 WhosOn works through a client, downloaded to a user’s desktop and compatible with both Windows and Mac operating systems. Agents are required to copy a line of code to their site, in order to activate the client. 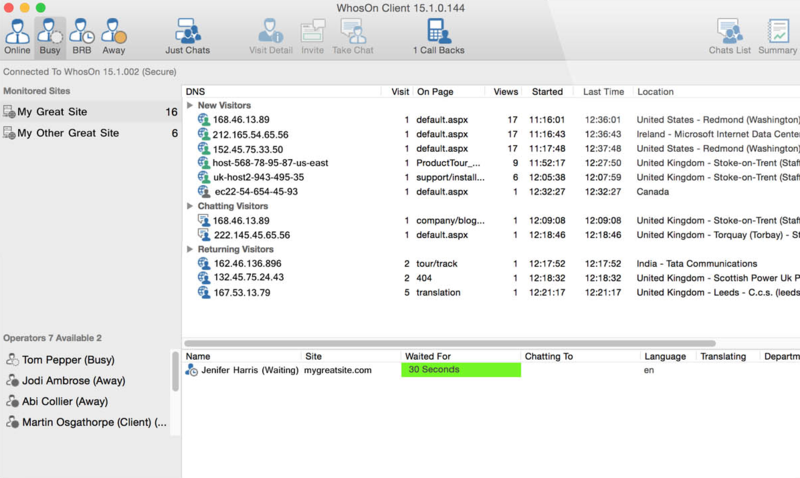 The WhosOn client shows site visitors moving through a website in real time. 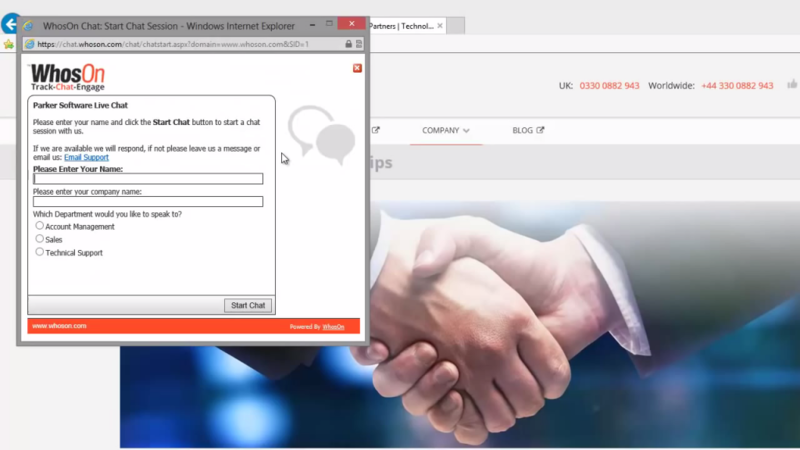 Compatible with multiple domains, the client allows agents to view, accept and respond to chats. “Canned” responses allow agents to quickly respond to frequently asked questions, while customer waiting times and agent allocations can also be viewed from the client. Using WhosOn, agents can invite site visitors to chat, engaging them at important points in the customer journey. Visitors wishing to chat can be routed to a pre-chat survey, designed to assess their needs and ensure that the chat is directed to the right department, such as sales or technical support. WhosOn enables agents to view a range of information about site visitors in real time. Available information includes the page a visitor is currently on; the start time of their session; the operating system they are using and the location of the customer. 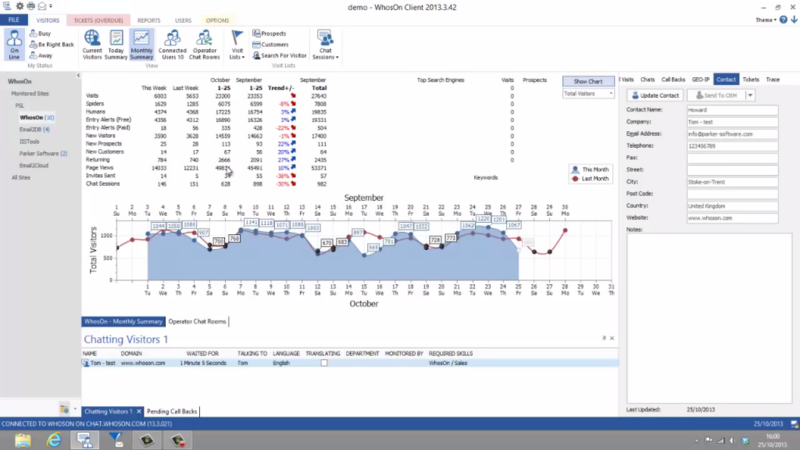 WhosOn allows agents to turn this data into actionable insights using the reports function. Agents can view information as data or in graph format; in real time or historically and in over 80 different report formats. The client also provides data relating to the number of chat requests received; Pay-Per-Click campaign success, based on a specific tracking code or a monthly comparison of agent response times. A useful feature of WhosOn is the ability to create tickets via live chat, in order to deal with requests raised through a chat discussion. Tickets can be distributed to a particular agent, as required and ticket responses can be delivered via threaded email. A co-browsing feature enables agents to assist site visitors with their online session, while managers can monitor sessions and train in real-time, sending private messages to agents to assist. WhosOn can be integrated with a variety of CRM systems enabling more efficient prospecting, these include Office365, Salesforce, Microsoft Dynamics, Sugar CRM and CoreMetrics. WhosOn is a highly sophisticated CRM tool with the potential to transform the way businesses interact with customers at important stages in the purchase cycle – it is a must have tool for any business serious about Customer Relationship Management. 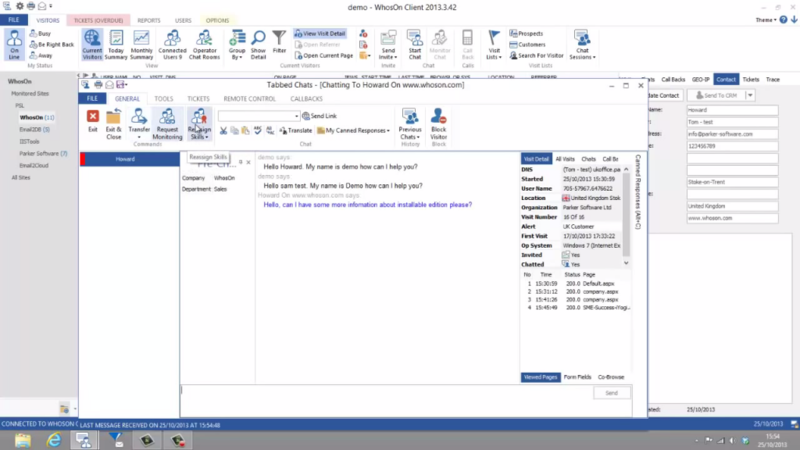 Find out more about WhosOn, visit the Parker Software Crozdesk Provider Page.